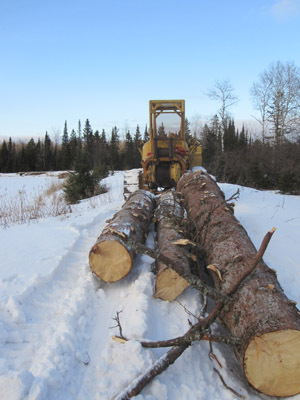 This afternoon I made up my mind to start the dozer and try again at getting the two trees down that have been hung up since I cut them, and to skid some of the logs back to the sawmill. I plugged in the dozer and started carrying firewood. I carried for about a half hour and filled the woodpile in the entryway. Then I sharpened and gassed up the chainsaw, and loaded it onto the dozer. I checked the oil, and it was about a quart low. I brought out the 5 gallon pail of oil (you buy your oil by the 5 gallon pail when your dozer is 60 years old) and dumped what was left in the bottom in. It wasn’t enough, so I opened the spare pail of oil and added about a quart of that. I’m hoping as things were developing that I won’t echo the last time I tried to do this job, where I spent a whole day getting back to square 1. I’d plugged the dozer in and done other chores because it needs to warm up for about an hour before it wants to start on these cold days. I mounted the dozer and pushed the plunger. It spun but did not sputter. I gave it a small shot of ether and it sputtered, but did not start. I hit the starter one more time and it barely started. These old diesel engines do not like the cold weather. I can’t say that I blame them. Franco and I headed out to the woods, me driving along at about a mile an hour, and Franco using his nose and running around in circles. When we made it out there, I backed the dozer around as before and payed out the winch cable. I wrapped the choker around the first leaning tree, got back in the cab, and engaged the winch. It grunted at first, then pulled the tree off its stump. I pulled it as far as I could, but the tree was still leaning. I had to get it down on the ground so I could trim the branches and buck it to length. I called this tree the porcupine because of all its branches. I moved the dozer away from the tree and engaged the winch again. The tree moved again, but still did not come down. Those porcupine branches were really holding on! I moved one more time and down it came with a satisfying thump. Then I moved to the second tree and it came down easily. Next I backed up to the big tree I’d cut down and bucked up earlier this winter. I’d made a 16′ log out of the bottom section, and then two 10 footers. I choked them on the cable and hauled away. They came out of the woods without hanging up on another tree or a stump. Things were looking up. My winch brake quit working sometime in the last millennium, so to skid the logs, I wrap a chain around the chokers, and the other end on the tow bar of the dozer. When I drove away, they lined up behind me just like soldiers. That 16′ log was big and heavy. The poor old dozer really had to grunt to move along with the heavy load sliding behind it. The least incline caused me to have to stop the machine and let the engine rev up, and then drive another few feet until I crested the hill. Once we made it to the road, the going was easier. I pulled in next to the sawmill rack, unhooked, and parked the dozer for a well deserved rest. Next I’ll go back out there and finish bucking and trimming, and haul the rest of the logs back. Then we’ll start the sawmill and make another bunch of 2x4s. This entry was posted on Saturday, March 5th, 2011 at 10:40 pm and is filed under Uncategorized. You can follow any responses to this entry through the RSS 2.0 feed. You can leave a response, or trackback from your own site.